Most of us remember or have seen the traditional Thanksgiving craft in which you trace your hand and turn it into a turkey. Whether you color, paint or paste it, this is a classic Thanksgiving craft that is easy and fun for kids. A great way to make this craft into a permanent decoration is by using fabric, cotton and some thread to make a Thanksgiving hand decoration that you can display year after year. Take your festive fabric that you’ve picked out and trace your left hand loosely on the fabric. Cut the hand. Then closely trace the cut-out hand on the wrong-side of the fabric. Then cut it out as well. Be creative and cut out pieces of felt to add details to the turkey. You can use a different color to glue to each finger to make the feathers. 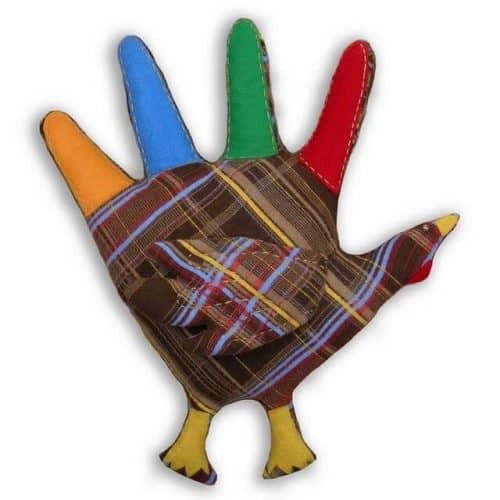 You could also use different patterned fabric if you want to create a really artistic turkey. Glue on your fabric details to whichever side is the front of your turkey, or the side that you want to display. Don’t forget to glue on a bead for the eye. and a needle from your fully stocked sewing basket and sew together the two hand cutouts. Start from the left side of the wrist and go up and around each finger and stop so that at the bottom (were your wrist would be) leave it open. Tear apart some cotton and gently stuff the turkey hand! When you’ve stuffed it as much you want, then sew the open end shut. Display your home-made turkey hands somewhere family and guests can admire them this Thanksgiving and the next.